Q. About a year ago I considered the ZVOX SoundBase you reviewed to enhance TV sound quality. More recently, you also recommended a considerably less expensive soundbar by Insignia. When I went to Best Buy, the young salesperson dismissed the Insignia as “not much better than your TV speakers.” I am only seeking more clarity from television audio, not home theater sound, but the more expensive ZVOX SoundBase offers technology labeled “AccuVoice” to enhance the clarity of dialogue. I have particular difficulty with certain BBC and public television programs with strong accents. I would appreciate your thoughts as to the relative merits of your two recommendations in consideration of the price differential. A. For anyone who missed last year’s column, I raved about the ZVOX SoundBase 320 for its great sound, easy setup, and convenient form factor. You just place you TV on it, connect it with an optical cable, teach it your remote’s commands, and enjoy. It provides high-quality, room filling sound without the complexity or wires of a home theater system. I disagree with the salesperson’s comments. The Insignia soundbar is much better than TV speakers, but you have to consider how bad the TV speakers are to put it in perspective. 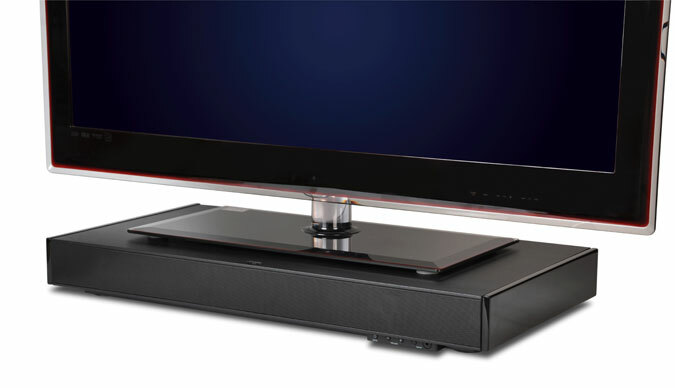 It isn’t in the same league as a ZVOX SoundBase, a serious audio component. You may be surprised to learn that I received many emails with questions similar to yours. It got to the point that I decided an experiment was in order. I visited a local reader who wrote to me and we tried the Insignia soundbar compared to the speakers in his older Panasonic plasma. The Insignia soundbar was an improvement, but for those who have difficulty understanding dialogue the improvement was not significant. Of course, the difference will vary based on the quality of the television’s speakers, and in this case it was an older Panasonic plasma that actually had pretty good sound for a flat panel. The difference would probably be more dramatic with an ultra-thin LED-LCD set with tiny speakers. In your case I think the ZVOX is the way to go. It’s better to spend a bit more and get what you want than pay a not-inconsequential $100 and not be fully satisfied. The AccuVoice feature will provide a dramatic improvement over your TV’s speakers or the Insignia soundbar. Not only do you get better dialogue, everything will sound better and everyone in the room will benefit. You have to get a Platinum Series ZVOX SoundBase to get the AccuVoice feature. Probably the best value in the line is the 570, which can support TVs up to 60-inches in size. Not only does it have AccuVoice, it has surround sound from a single box, Bluetooth for music streaming, and will reduce commercial volume so it doesn’t blast you out of the room. Normally $349, it is on sale for $299 for the holidays.